Hmm... don't know what to think. At least you're trying hard. Penguin needs to be checked. Art Animals is a new webcomic that I'm planning to release Monday and Friday along with Dungeon Legacy on Thursday. I want to do a Monday/Wednesday/Friday update but a Dungeon Legacy page is a lot of work. I might have to switch to Monday/Thursday/Saturday if I can't keep up. I'll let you know if that happens. 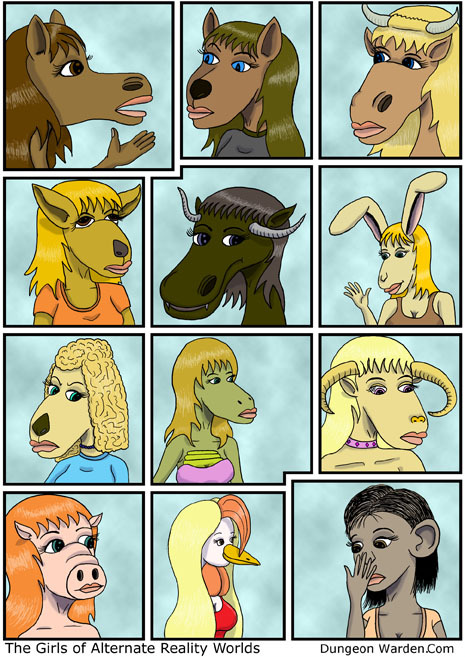 Art Animals is about a group of humanimals who attend an art college together. There different social upbringings and cultures cause a lot of friction but their love of art brings them together. You don't need to be an artist to enjoy the comic but it helps. Artists are a breed apart from the general public and some of their quirks might seem odd to a non-artist. I hope you will stick with the story and take the time to get to know the characters. The comic is in a newspaper gag-a-day format and each strip should stand on it's own without knowing what came before or after. Let me know what you think. I'd like this comic to be a success and hope everyone will throw their support behind it.